This tutorial will walk you through the creation of a sample application that contains RadGridView. Before proceeding with adding RadGridView to your project, make sure the required assembly references are added to the project. You can add RadGridView manually by writing the XAML code in Example 1. 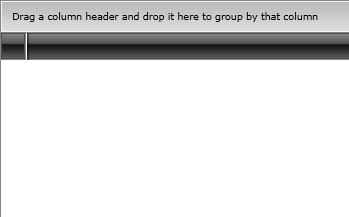 You can also add the control by dragging it from the Visual Studio Toolbox and dropping it over the XAML view. If you run the application, you will see an empty grid with no columns and rows as demonstrated in Figure 1. In order to populate the RadGridView control with data, you should create a collection of business objects. For the purposes of this example, create a new class named Club and add several properties to it, as shown in Example 3. If you want to support two-way binding, your Club class should implement the INotifyPropertyChanged interface and raise the PropertyChanged event every time a property value changes. Next, you should create the view model containing a collection of Club objects. ViewModelBase is an abstract class implementing INotifyPropertyChanged. It resides in the Telerik.Windows.Controls namespace. Now that you have prepared the needed sample data, it is time to bind RadGridView to it. 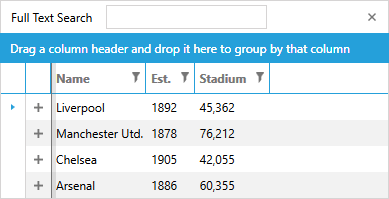 For that purpose, you should set the RadGridView's ItemsSource property to the collection of clubs. Example 5 demonstrates how you can bind the ItemsSource collection in XAML. The local namespace in the example corresponds to the namespace where MyViewModel resides. Alternatively, you can set the ItemsSource property in code-behind, as demonstrated in Example 6. Running the application containing the code from Examples 1 - 6 will result in a populated RadGridView, like in Figure 2. You can read more about data binding here. The RadGridView from the examples above contains three columns, one for each of the properties of the Club class.RadGridView automatically generates these columns. If you want to stop the columns auto generation and define the columns that you want to be visible manually, set the property AutoGenerateColumns to False. Example 7 demonstrates how you can manually prevent the automatic generation and define columns. The code in Example 7 is shown in Figure 3. 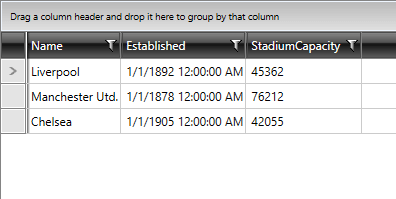 The XAML declaration of the RadGridView contains two columns: the first one named "Club Name" is bound to the Name property. The second named "Established" is bound, respectively, to Established. As a result, your grid control will have only two columns and no other column will be added because the AutoGenerateColumns property is set to False. You can read more about RadGridView columns here. Sorting, Grouping and Filtering of RadGridView are enabled by default. You can disable sorting for a specific column by setting its IsSortable property to False. You can disable filtering for a specific column by setting its IsFilterable property to False or by setting the IsFilteringAllowed property of RadGridView to False. 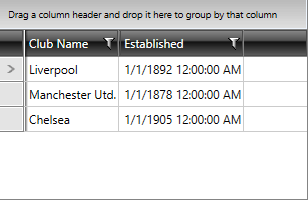 You can disable grouping for a specific column by setting its IsGroupable property to False. Figure 4 shows RadGridView with the Windows8 theme applied.